Oi-Ocha (お～いお茶) is a bottled Japanese green tea, that is consumed much like other soft drinks. Green tea is the most widely consumed type of tea in Japan, and is called “ryoku-cha(green tea)”, “ocha(tea)”, or “nihon-cha(Japanese tea)” (to differentiate it from Chinese green tea). In the past, green tea was often served after a meal or with sushi or a snack, but nowadays, green tea is consumed much like water or other soft drinks. There are various types of Japanese green tea; Sencha, Gyokuro, Bancha, Hoji-cha, and Genmai-cha are some of the main types of Japanese green tea. After harvest, green teas must be heated to stop the fermenting process. Japanese green teas are steamed whereas Chinese green teas are fired in a pan. There are exceptions however, as there are some few Japanese teas that are fired after harvest. The term, “Sencha” can be used to refer to Japanese green tea(excluding matcha) in general, but it is also used to refer to green tea made from tea leaves taken during the first and second harvests. 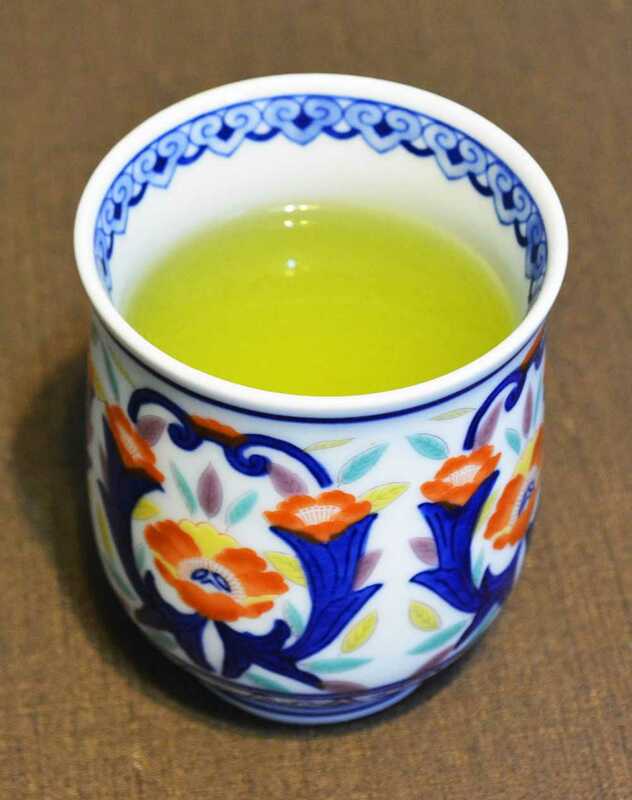 Of the many types of green tea in Japan, Sencha is the most widely consumed. Tea leaves from the first harvest called Shincha and are considered to be of high quality and the quality is said to decrease after each harvest. Shincha or Ichibancha is Sencha made from tea leaves harvested in the first harvest of the year, usually during May and June. Shincha is characterized by its fresh aroma and sweetness. The most high quality type of Japanese green tea is Gyokuro, a green tea that is grown in shade for a minimum of 2 weeks. By growing the tea leaves in shade, the amount of tannin produced in the tea leaves is far less, whereas the amount of amino acids produced is far greater than those produced under full sunlight. Since tannin leads to an astringent flavor, Gyokuro is less astringent and milder in taste than other green teas. Gyokuro is generally regarded to have a distinct aroma and a sweet, delicate flavor, whereas Sencha is regarded to be more astringent and light-bodied. The process of making Kabusecha is almost identical to Gyokuro, except for the fact that Kabusecha is grown in shade for around a week whereas Gyokuro is grown in shade for a minimum of two weeks. In addition, Kabusecha is made by covering each tea tree in a curtain whereas to make Gyokuro, the whole tea field is covered. The name derives from this process as Kabusecha literally means “covered tea”. The taste is said to be in between Sencha and Gyokuro. Bancha is made from green tea that is harvested after summer, during or after the third and fourth harvests of the year. It is considered the lowest grade of green tea because it is harvested to clean up the tea foliage after the Sencha has been harvested. Since Bancha uses fully grown leaves, the tannin content is high whereas the caffeine content is low. Bancha is often used to make Hojicha, a roasted version of green tea. In the Tohoku and Hokkaido regions of Japan, the term “Bancha” is used commonly to refer to Hojicha. Hojicha, although not green, is a green tea (often Bancha) that is roasted at a high temperature. The process of making Hojicha is said to have been invented in Kyoto in the 1920s. Hojicha is not as astringent as non-roasted green tea because the roasting breaks downs the tannins inside the tea leaves. Because of its mild taste and small caffeine content, Hojicha is often served as an after-meal drink in Japanese restaurants. Genmaicha(玄米茶) – Brown Rice Tea. Photo by Teabuzzed. Genmaicha is made from green tea(usually Bancha), popped brown rice that resemble popcorn, and steamed and fired brown rice. The taste of Genmaicha is light and aromatic, and can be widely affected by the quality of brown rice that is used. Japanese green teas usually go through a steaming process that lasts around 20 seconds to 1 minute. However, this differs in Fukamushi-cha as they undergo a longer steaming period of around 1 to 3 minutes. Fukamushi-cha generally have a darker green color and a sweeter taste, but less aroma than that of normal green tea. Green tea can have different names according to the region where they are produced. Uji-cha, Shizuoka-cha, Sayama-cha, Yame-cha, and Kagoshima-cha are some examples. Uji, the area where Uji-cha is produced, is thought to have been producing tea since as early as the Kamakura Period(1185~1333) and is highly accredited as a producer of high-quality tea. Yame, the area where Yame-cha is produced, is Japan’s greatest producer of Gyokuro and is also known for its high-quality tea. Shizuoka prefecture is Japan’s largest producer of tea, producing 40% of Japan’s green tea(2011), while Kagoshima comes in second.